The kitchen is the heart of the home, but in many older homes, the kitchen is closed off to the rest of the home. On average we spend about 182 hours a year in the kitchen, and for many, that’s time spent away from friends and family. A kitchen remodel can bring relief. A survey conducted by the National Association of Home Builders notes that kitchen renovations are the second most popular home improvement project, with 69 percent of homeowners stating they have already remodeled or plan to remodel their kitchen. Kitchen renovations account for roughly 40 percent of all money spent on home renovations. 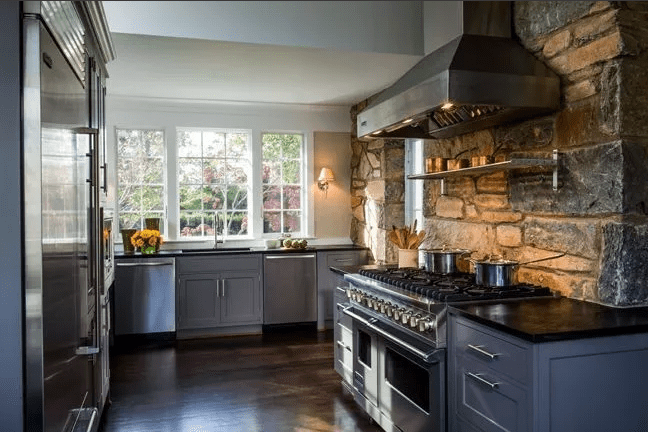 So why is a kitchen remodel one of the most sought-after renovation projects? The No. 1 reason kitchens get remodeled is to open up the space and encourage interaction with surrounding spaces. There’s a strong trend toward social living as two-income households look for ways to spend more of their downtime with friends and family at home. Rather than a solitary workspace, the kitchen is becoming a focal point in the home, with more and more people incorporating gathering spaces in and around the kitchen to foster family interaction while someone cooks. Connecting the kitchen to a living room allows the cook to be a part of the “action,” while taking down walls between the kitchen and the dining room means quick access for serving. Renovations like this make each space feel larger, maximizing the utility of the rooms’ footprints in an area where space for expansion might be hard to come by. Another common reason for a kitchen remodel is making cooking easier. Homeowners today are savvier chefs than ever, thanks to the proliferation of TV cooking shows and the endless amount of recipe sites on the web. With the expanded availability of commercial-grade appliances, amateur chefs have specific visions in mind for their dream kitchen. Most homeowners also want to include an island in their new kitchen design. With cooking becoming a more communal experience, additional counter space allows multiple people to take part in the process. An island gives would be sous chefs a large work surface for meal prep. An island can also replace the storage space lost when removing walls to open up the kitchen. Islands are also a great focal point and gathering space within the kitchen. A kitchen remodel can breathe new life into your house, and raise its value. It’s been estimated that even minor kitchen renovations can garner a return on investment of up to 80 percent. Older kitchens with inefficient layouts and dated appliances will not do much to attract potential buyers. Updating your kitchen will increase your home’s value and expand the pool of potential buyers. Your kitchen remodel is also a chance to “go green”. Reduced water and energy consumption pays off in reduced utility costs as well as some potential tax benefits. You can replace old and outdated appliances with new, energy-efficient models. Many new refrigerators, dishwashers, and even light fixtures are designed to keep your bills low without sacrificing performance or style. At Pagenstecher Group, our design-build experts will work with you to develop the kitchen plan best suited for you and your home. The Pagenstecher process begins and ends with listening. We know that creating a cohesive vision for your new kitchen requires a complete understanding of you, your family, and your lifestyle. So what kind of kitchen remodel is right for you? Contact us today for a consultation.